An all new design baby walker in a classic truck design. This walker will help your child with early learning through play. There is an endless possibility for play, take the truck for a walk or place all your favourite toys inside it. The front of the truck can also be used to store other toys. A great gift for your child, guaranteed to provide hours of educational fun and games. 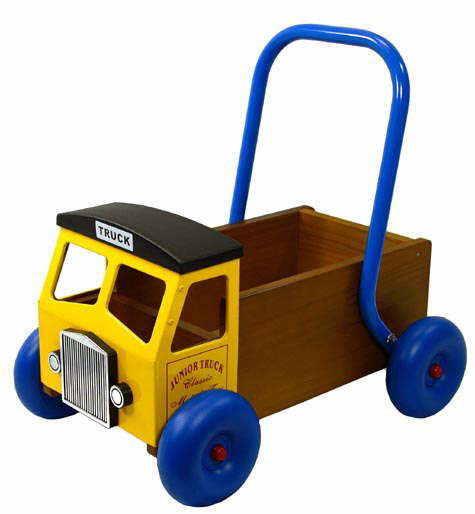 This truck walker is made from solid wood and the cabin is strong steel and has a strong steel handle. This makes a very distinctive and high quality product. The wheels are solid, durable and moulded to ensure maximum stability. Dimensions: 18" long x 18" high x 14" wide.